This year is the Doctor Who 50th anniversary bash. The BBC has announced that as part of the celebration they will be releasing eleven short stories written by beloved children’s authors set in the Doctor Who universe. No authors are confirmed, yet, but at the top of the assumed list is J.K. Rowling, author of the Harry Potter series. Each of the eleven authors will write one story about one of the eleven Doctors. The first short story will be out at the end of the month, and the book will be available in November. Joss Whedon is back behind the camera and filming the pilot for the S.H.I.E.L.D. television series for ABC. Whedon is currently working on both the pilot and the sequel to the Avengers movie. He mentioned that he wants to spend as much time on the show as possible, but he needs to maintain balance between the projects. While the Avengers sequel is his number one priority, Whedon is confident that he has enough people he trusts to take care of the S.H.I.E.L.D. show. There is not a set release date for the pilot, but you can count on seeing it sometime next fall. Captain America: The Winter Soldier will be coming out on April 4, 2014, but not everyone is returning. Hayley Atwell played Peggy Carter in the first Captain America, but she confirmed she will not be in the sequel. Winter Soldier will take place in the present day so her character would be older, if in the movie at all. This also means we shouldn’t expect to see her in flashbacks, unless they were directly from the first movie. It is likely that the character Sharon Carter will replace Peggy Carter as the love interest in the upcoming film. Possible character details from the 2015 Justice League movie have been released. If an inside source is correct, the movie will follow Gerry Conway’s 1980 Justice League of America story arc from issues 183-185. The main team will consist of: Superman, Wonder Woman, Batman, Flash, Green Lantern, Martian Manhunter, and Aquaman. Both Alfred Pennyworth and Lois Lane are listed as having cameos. While the notes don’t mention if Batman will be linked to the Dark Knight series, most sources believe not. The source does mention Superman is being written like the incarnation in Man of Steel, with a little help from Zack Snyder who is consulting. It looks like Green Lantern will be Ryan Reynold’s character, with a complete revamp. Also, the Wonder Woman script is in development currently as well, and will be set before the Justice League movie. Assuming this information is correct, the Justice League film will not only be more tied in to past DC movie continuity than previously expected, but it will also be a very elaborate venture requiring several rewrites to tie in anticipated sequels. Universal Studios first added the Wonderful World of Harry Potter, and now Universal and Tolkien Estate are planning a Middle Earth theme park. For everyone who can’t afford to fly out to New Zealand in order to experience a Hobbit-like landscape, there is a chance a little slice of Middle Earth will be coming to the US. It’s been a big week for Trekkies. 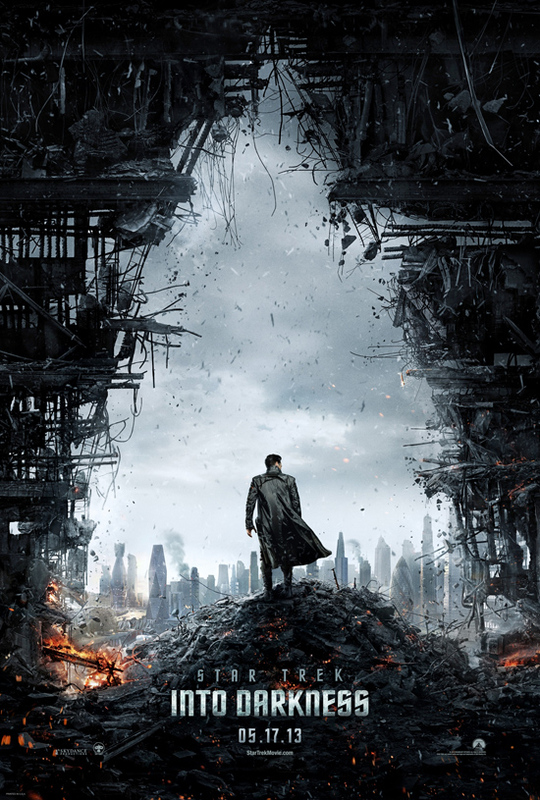 The first teaser trailer for J.J. Abrams Star Trek: Into Darkness has been released. The explosive trailer was just one of several announcements since the start of the month. The new movie website has released the new poster as well as the movie plot. 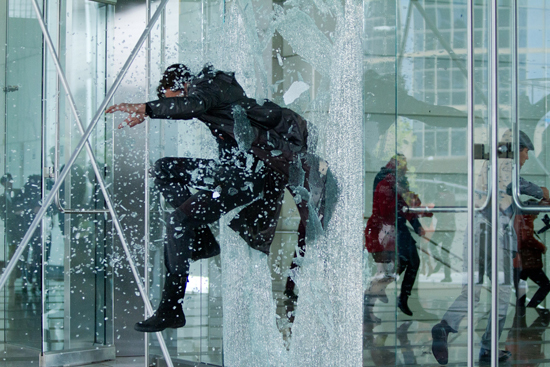 Keep your eye out for more Star Trek news as Into Darkness launches into theaters on May 17, 2013. There are a lot of questions floating around about the upcoming Star Wars movies. A few actors have spoken up about returning to the film. Samuel L. Jackson wants to work on the movie in some way. Since his character died, he said he’d be happy returning as a hologram. Ewan McGreggor also spoke up saying he’d return if needed. It looks like the only person not getting in on the project is George Lucas. Lucas described his hands off consulting role as being something of a Star Wars encyclopedia. The Hobbit: An Unexpected Journey comes out this Friday, but some lucky folks in New Zealand have already had the chance to enjoy it. However, there are complaints that the innovative 48fps format that Jackson used is causing nausea for some. Jackson fought to bring 48fps to theaters, so we’ll have to wait until The Hobbit is released worldwide to know the extent of problems the high frame rate will cause. While the first Hobbit film isn’t out just yet, the first still from the second movie The Hobbit: The Desolation of Smaug was release via EW. Man of Steel is already being called one of the most disappointing movies of 2012. This is a bit confusing as Zack Snyder’s Superman movie doesn’t release till June 14, 2013. Yahoo! writer Jonathon Crow hasn’t even seen the film yet. He was disappointed enough that the movie wasn’t released in 2012 to take umbrage, and was further perturbed by the fact that Snyder was throwing tradition away with his superhero’s red underwear. However, the comics have had Superman out of the red briefs for some time now. Don’t take these early negative critiques seriously, Christopher Nolan has put his full support behind the film. A new trailer, the second, has just been released for the film – see above. Back in September, the CW announced they were going to film a Wonder Woman pilot. An in depth character bio has been released. Despite Wonder Woman being referred to as Iris, pilot script writer Allan Heinberg tweeted it was just a code name. There have been a few failed attempts at bringing the Amazonian Princess back to TV. Let’s hope the CW do as well with Wonder Woman as they did with Smallville and Arrow. The Justice League movie isn’t set to hit theaters until 2015, but reports that Darkseid will be the major movie villain have ht the internet. Thanos was the hand controlling Loki throughout the Avengers, so it’s fitting that the Justice League would face off against what could considered DC’s counterpart to Thanos. Whether Darkseid will battle the JSA on his own or be using pawns is still unknown. Joss Whedon has handed in his outline for Avengers 2. Marvel’s Phase 2 will officially begin in 2013. If everything goes right, the S.H.I.E.L.D. series will premier next year. ABC President Paul Lee is excited about the series. He said, “It’s very Joss Whedon,” which should only be taken as a good thing. The hunt for Harry Osborne is over. Chronicle star Dane DeHaan will be playing the part in the Amazing Spider-Man 2. Many expect he will be the villain in the sequel, although he may be fitted for the best friend role in this outing before becoming a villain in a subsequent one. The movie is set to start production in early 2013 for a May 2, 2014 release date. Some huge news for X-Men fans. The sequel to X-Men: First Class has two new cast members: both Sir Patrick Stewart and Sir Ian McKellen will be in the movie. Michael Fassbender and James McAvoy have also signed up. They may need them for a classic X-Men time travel story or perhaps a snapshot of the future. It’s a sad week for Batgirl fans. Long time DC writer Gail Simone has been fired from the Batgirl book – via email! Simone wrote Batgirl for the New 52 after lengthy runs on Birds of Prey, Secret Six, and Wonder Woman. The graphic novel of her first story arc, which brought back Barbara Gordon as Batgirl, landed at No. 4 on the New York Times graphic books bestsellers list. Simone pushed boundaries with her characters, and had plans for a new transgender character that are now being scrapped. This upsetting news came just a week after Karen Berger stepped down as Executive Editor of DC’s Vertigo brand. It’s that time of year, everyone is releasing their Best of 2012 lists. Spike TV hosted their Video Game Awards last week. While they certainly aren’t the Oscars, they’re the biggest name in video game awards right now. Out of the winners, there were some upsets. Borderlands 2 took Best Shooter and Call of Duty: Black Ops II didn’t win anything. The Walking Dead took the Game of the Year title. NerdBastards did an excellent job assembling all the amazing trailers from the show. Kevin Smith announced he was leaving the movie game with his film, Hit Somebody. Well it turns out that might not be the case. The film was originally one movie, then two movies, and now it is back to one movie or perhaps a miniseries. That being the case, Smith is looking at leaving the movie business the way he came into it. He is now just waiting on Jeff Anderson to sign on so he can make his last cinematic creation, Clerks III. The market for digital movies has grown a lot in recent years. While there are several choices for getting your films online, most of them seem to be equivalent to each other. That is until Netflix signed an exclusive deal to stream Disney. It means you will soon find all your childhood favorites on Netflix. Some movies have already been uploaded including Alice in Wonderland and Nightmare Before Christmas. Paramount has just released a poster for the much anticipated new Star Trek film, Into Darkness. Cast members reprising roles from the 2009 J.J. Abrams-helmed Enterprise voyage include Chris Pine (Kirk), Zachary Quinto (Spock), Karl Urban (Bones), Simon Pegg (Scotty), John Cho (Sulu), and Zoe Saldana (Uhura). The most notable newcomer seems to be Benedict Cumberbatch, from the critically acclaimed UK TV series Sherlock, who is rumored to be playing Khan, a role that was originally played by Ricardo Montalbán in the ’60s TV series and Star Trek II: The Wrath of Khan film. The Enterprise will head Into Darkness in theaters on May 17, 2013. Many Marvel movie fans will be pleased to hear the Marvel Cinematic Universe: Phase One – Avengers Assembled box set has received a new release date. Marvel ran into a problem with the original suitcase the set comes in when a German manufacturer filed a suit. Those who have waited despite the delay will be rewarded with first look teaser material for Iron Man 3, Thor: The Dark World, Captain America: The Winter Soldier, and Guardians of the Galaxy. The box set is now releasing on April 2, 2013. Despite all the rumors to the contrary, director James Mangold has revealed there will be no trailers for The Wolverine before The Hobbit. The first trailers for the movie won’t be until early 2013. The Wolverine will be coming to theaters July 26, 2013. The CW’s new show Arrow adds yet another member from the DC comic family to the series this week. The Huntress, Helena Bertinelli, will make her debut this Wednesday. So far, there have been appearances by Deadshot, Deathstroke, and the Royal Flush Gang. It looks like Huntress will be the first hero to join the crew, although she will likely start off as an anti-hero/villain. Peter Parker has been Spider-Man since his first appearance in Amazing Fantasy #15. While Miles Morales took over in Marvel’s Ultimate Spider-Man, Peter Parker has remained Spider-Man in the Amazing Spider-Man series. That might all be coming to an end. (Spoilers ahead, if you need to catch up on the comics skip down.) 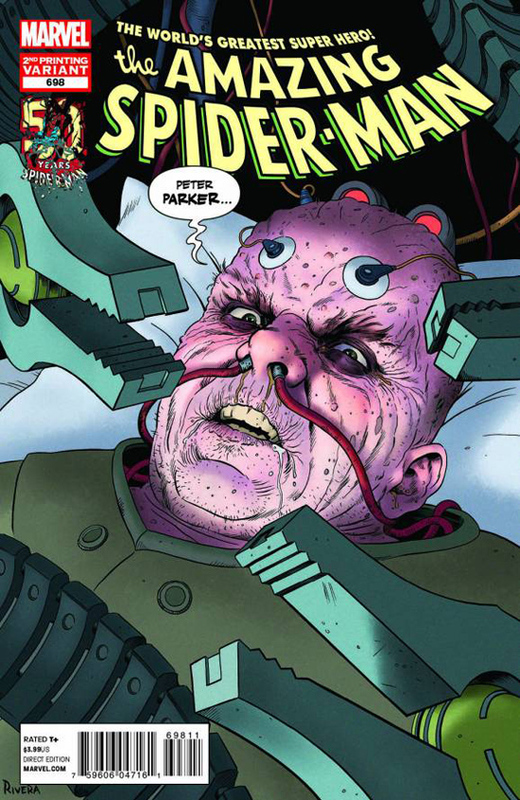 In the final issues leading up to the release of Marvel Now’s Superior Spider-Man #1, Doc Ock has taken over Peter’s mind and body. Amazing Spider-Man #698 sold out and has gone to second printing. In a tweet from writer Dan Slott (supposedly meant to be a direct message), it may have been revealed that Miguel O’Hara, Spider-Man from Spider-Man 2099 will be taking over in Marvel Now’s Superior Spider-Man. Some are calling the tweet a red herring meant to mislead fans. What do you think? Is it time for Peter Parker to step down or will he always be Spider-Man? There is more news from a galaxy far far away inside a Disney castle near you. Michael Arndt might be working on the script for the first movie in the new Star Wars series, but it looks like Disney is calling in the veterans to help. Lawrence Kasdan and Simon Kinberg have been approached by Disney to work on the later installments. Kasdan penned two of the original Star Wars scripts: The Empire Strikes Back and The Return of the Jedi. In case you missed out on reading the book growing up or just want to check to make sure the film story lives up to it, the synopsis for the Ender’s Game film has been released. For those who have been worried about the project, the synopsis is dead on. Ender’s Game releases in theaters on November 1, 2013.